We’re very pleased to welcome, once again, Diane Dargay as our Guest Blogger. Today she shares another great Performance Event, and judging by the look on her dog’s faces it must be a favorite of theirs as it sure looks like they’re having a blast to me. Thank you so much for sharing Flyball competition with us Diane! 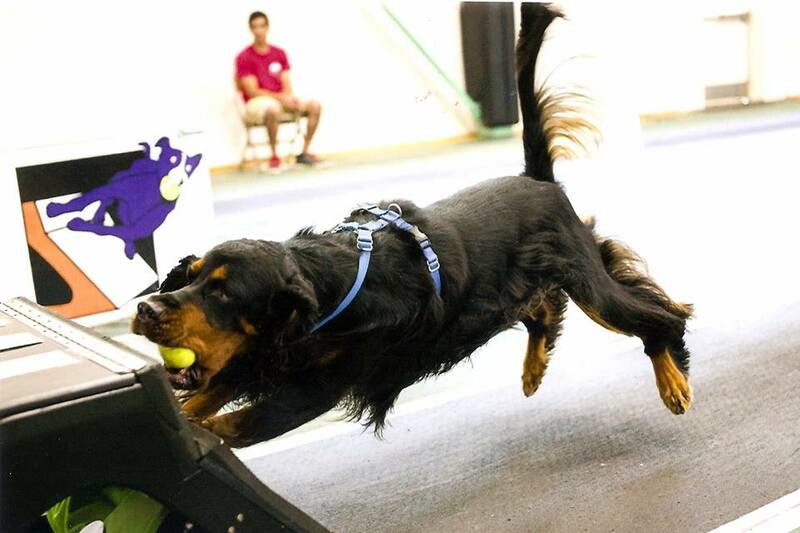 Flyball is a relay race in which dogs race over a series of four hurdles to retrieve a ball from a specially designed flyball box. The dog must push on the front of the box in order to activate a trigger mechanism that releases the ball. When the ball springs out of the box, the dog catches the ball and brings it back over the four jumps to his/her handler. As the dog crosses the start/finish line, another dog races past him to repeat the same procedure. Teams of four dogs race against each other for the win. Teams consist of six dogs, but only four race at a time. Video Link – Diane Dargay with Jackson (single dog flyball race) This was Jackson’s first tournament setting at 15 mos old. We just practiced with the team in warmup all weekend. 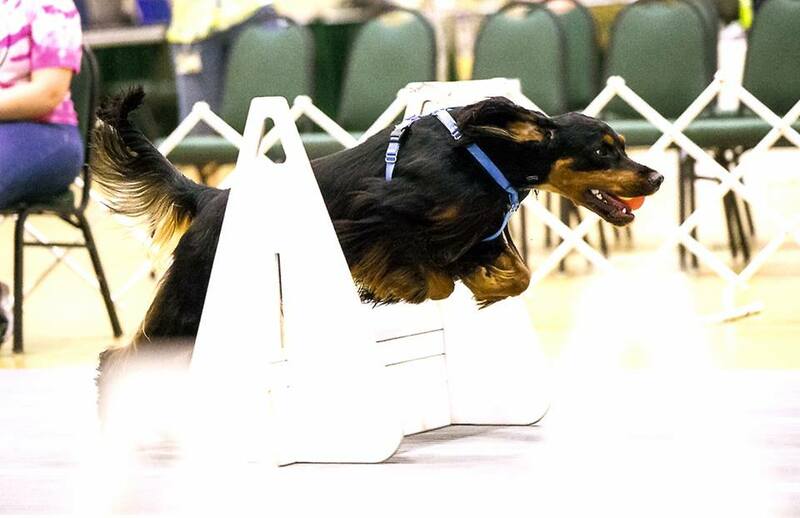 If you notice, at the flyball box there is a jump in front and ring gate at the side as prop to navigate his turn. Each team brings to a tournament their own flyball box and set of balls. Balls can be any size as long as they bounce and roll and fit into the flyball box. Dogs can be of any breed and mixed breeds are welcome. The height of the jump varies from 7″ to 14″ and is determined by the height of the smallest dog running, minus 5 inches. 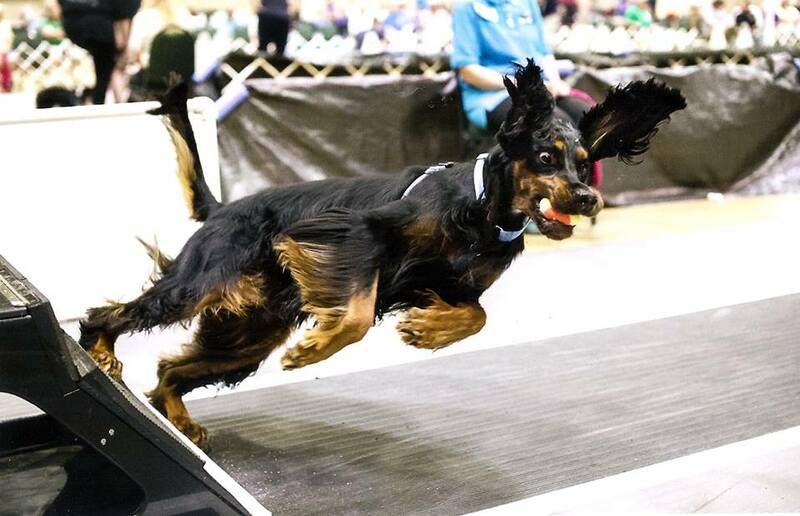 So, if the height of the smallest dog is 15″, the entire team would jump at 10″. Aggressive dogs are not tolerated and the judge has the right to eject a dog that shows any aggression toward another dog. Teams are classified into divisions so you are racing against teams with times that are similar. In a tournament, there will be a head judge, two box judges (one for each team) and two line judges (one for each team) The head judge runs the entire heat. The box judges make sure the dog pushes the front of the flyball box. The line judges monitor the start/finish line and record the time of the heat. Points and titles are achieved by team time. If a team runs under 24 seconds, 25 points is awarded to the four dogs that raced in that heat. Under 28 seconds, 5 points is awarded and under 32 seconds, 1 point is given. Titles start at 20 points and go to 100,000 and beyond. The maximum number of heats in a race is five. In order to receive points for a run, the dogs must run clean……which means not dropping a ball, missing a jump or hitting the start line before the previous dog comes back. If there is a fault, the dog must rerun at the end of the line or the heat will be considered a “no finish”. In training, we start by teaching what we call a “swimmers turn”. This is just like you see at the Olympics…….they touch and push off with their feet. It is safer for the dog as it is a repetitive motion. This does not put stress only on the front end. Starting with a seven inch jump away from the flyball box, a treat is given once the dog jumps over. Then a treat is given once the dog jumps back. After many times of treats on both sides, we then start with only one treat after a jump and back. Now the dog has to jump and U-turn (bounce) and jump back in one motion. Once they have accomplished the bounce, then the jump is moved to the flyball box. Now the bounce is bouncing off the flyball box. After they get proficient at bouncing off, we start adding the ball on the ledge and then eventually in the hole. While we are training the box, we separately train the series of four jumps…..one jump at a time and work up to four. Then eventually put the box and the jumps together. When they are proficient at accomplishing a full run of down and coming back with the ball, we start adding distractions…i.e. other dogs, balls on the ground. They have to pay attention. We also start working on passing another dog and lineups of dogs. Putting all the pieces together depends on the aptitude of the dog. It can take anywhere from six months to two years to completely train a dog. You also have to consider working them in a tournament setting while another team is practicing. If you dog is really ball focused, it becomes easier. Previous PostCoursing Ability Tests – Go Gordons!!! 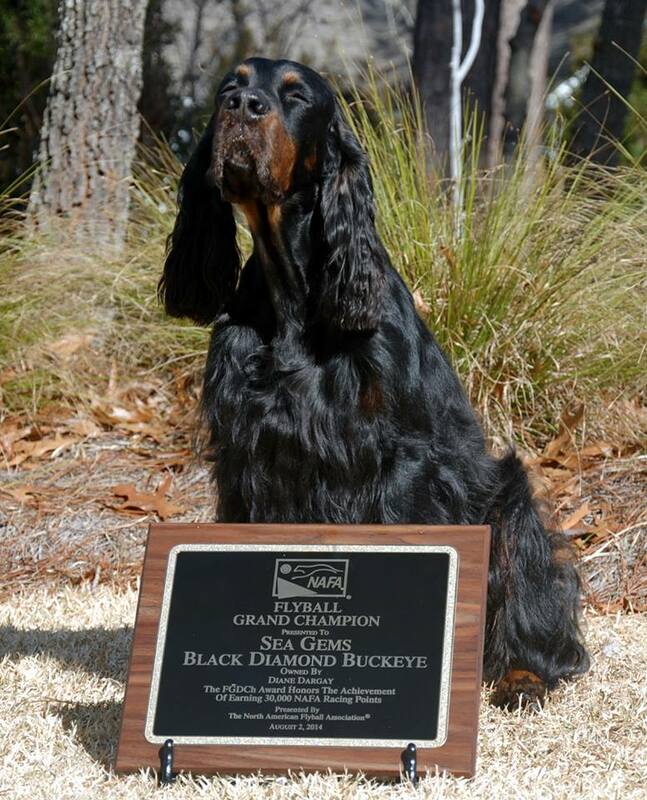 !Next PostPreferred Breed Type – Why the Stand-out Dog Can Be a Loser! I agree that it looks like lots of fun but I’m cringing. I went to a seminar just last Sunday about canine injuries in dog sports. Most of it was related to agility but there was a whole section on Flyball. One of the photos that has stuck with me ever since is of a Border Collie just as he hits the box. His front legs are completely flat on his pasterns, a 90 degree angle. The speaker said she sees lots of flyball dogs with injuries related to that kind of stress on the joints. I think I’ll stick with Nose Work:-). This is true. If the box turn is not taught correctly, injuries do happen. Sounds like they taught this Border Collie to splat at the box. It also does not help as Border Collies are high energy dogs. There are many dogs that are retired at 12 and 13 yrs of age that have done flyball for 10 yrs. It keeps them young and keeps the weight off. Muscles are kept in shape. But injuries do occur in various sports even bird hunting. It is all about he training.